Native to the Himalayan mountain range between India and China, cymbidiums are shade-tolerate orchids that do best in cool temperatures with high humidity. 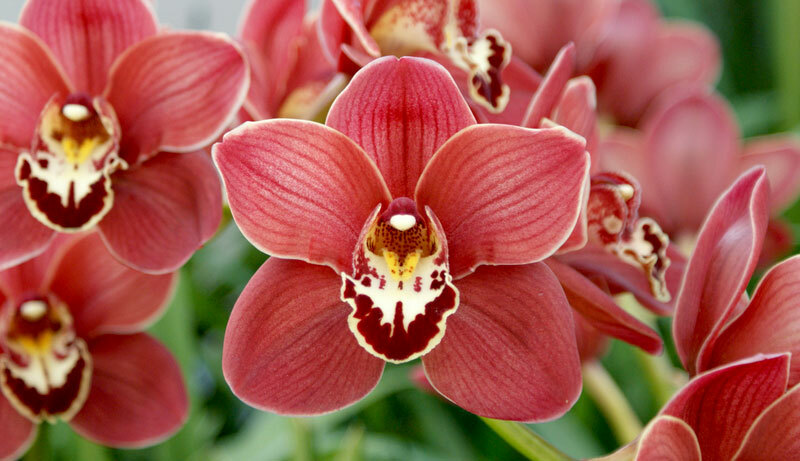 Cymbidium orchids are popular with home growers because they are among the easiest exotic plants to care for. Light: Grow cymbidiums with filtered sun for optimal blooms. Half shade or dappled sunlight will provide just the right amount of light. Avoid direct sun exposure, especially when placing plants outdoors. Water: Always water in the morning to allow plenty of time for moisture to drain before evening temperatures cool. Cymbidium orchids like to be kept evenly moist—damp, but not soggy. Allow the soil to dry slightly between waterings. During the winter months, when it’s best to allow the soil to get a bit drier, you may need to water as little as once a week. In the summer, this may increase to daily watering. Soil: Cymbidium orchids require special potting mix. A medium or fine fir bark mixed with peat moss or perlite will also work well if cymbidium-specific mix is unavailable. Temperature: These orchids have varying temperature needs throughout the year. Temperatures need to fall to about 45-55°F in order to trigger the winter blooms. Since summer temperatures are much warmer, and many owners like to place their cymbidiums outdoors for a time, watch for temperatures above 85°F, which can cause the leaves to burn. Fertilizer: Cymbidium orchids don’t require much in the way of extra nutrients. Slow-release fertilizer pellets added to the potting soil at the beginning of the season are usually enough for good results. Choose a balanced fertilizer and use only when plants are actively growing. Cymbidium orchids have showy flowers that last six to eight weeks in winter and spring. Plants range from 10-36″ tall. With proper care, these orchids will bloom for years.